See the list below for a timeline of project events and associated conferences, congresses and symposia that the Pilgrimage and England's Cathedrals project will be involved in. This conference, which took place at the conclusion of an important three-year partnership between the Centre for the Study of Christianity and Culture at the University of York and the Church of England, brought together Chapter members, education and visitor department staff, and other stakeholders to discuss key theological and practical issues, share best practice, and consider new mission strategies. Papers given by Dee Dyas, Louise Hampson, Marion Bowman, Tiina Sepp and John Jenkins. As part of disseminating the findings of our research project examining experiences of visiting and engaging with sacred places, past and present, we ran a half-day workshop for those who manage a wide range of sites of religious or spiritual significance, such as former monastic sites, in order to inform debate about how such sites are promoted, managed and interpreted. 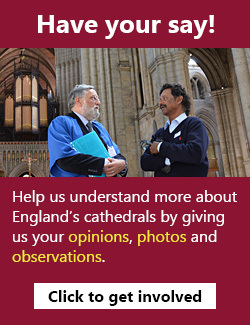 Historic England and English Heritage are partners in this research project but we extended this invitation to members of other heritage organisations such as the National Trust who find themselves facing new and challenging demands from visitors wishing to understand and explore the religious/spiritual dimensions of sites in greater depth. This conference was designed as an opportunity to share research outcomes of the 3 year AHRC funded project on ‘Pilgrimage and England’s Cathedrals, Past and Present’ in conversation with others working in the fields of pilgrimage and both journey- and place-related spirituality. For more information, see our conference webpage. Our research project into past and present experience of pilgrimage has focused on four case-study cathedrals (Canterbury, Durham, York and Westminster Cathedral), but the issues raised and findings are relevant to all cathedrals, and would usefully inform debate about visitor management, interpretation, and the challenges of balancing a cathedrals’ dual identities as sacred spaces and heritage sites for the many audiences who visit. We are therefore inviting key staff with responsibility for visitor engagement and education to explore together what the research findings suggest and how best to disseminate best practice in a half-day workshop on 17th July in York. There are a few places left, so click here more information on how to book. Closing date is 30th June 2017. Visit Westminster Cathedral on the feast day of their resident saint, St John Southworth, and explore his life and example with a short prayer trail we have created around the Cathedral. Join us for our Pilgrimage Experience Day at Durham Cathedral on Friday 9th June.